One of the simplest ways that you can trade the markets is by using a strategy known as trading the price action. This basically means that you are deciding on what direction you anticipate the price of the market moving without using any technical indicators at all. My version of this trading strategy uses a single moving average and the price. That’s it. You can remove the use of the moving average if you have set profit target levels. Lets take a look at this Mastercard chart. You can see that on here we have a multitude of indicators and drawings that are serving the same purpose… that is to help give us an idea of where the price might be heading. The chart above may seem complicated to many of us… but some traders will genuinely use a set up similar to this. If I were to use a chart with that many indicators on I don’t think I’d be any closer to an accurate decision after analysis. So let’s have another look at the chart with all the indicators removed. That’s better… a nice calm chart. Now we have to decide on where we think the price will go next? From my perception, I think that the price will continue to rise, although I also think that there may be some price correction soon, before the upward trend continues. So that being said, where do I enter the trade? I don’t want to just enter the trade with a random guess. So I need to analyse the entry point visually. I can do this by reading and analysing the candle patterns, waiting for a price correction to finish and by drawing imaginary trend, support and resistance lines. So let’s take a closer look at my mental price action trading strategy. You can see from this chart that I can mentally draw a picture of what is happening. Obviously I’m drawing on the chart to highlight my thinking. 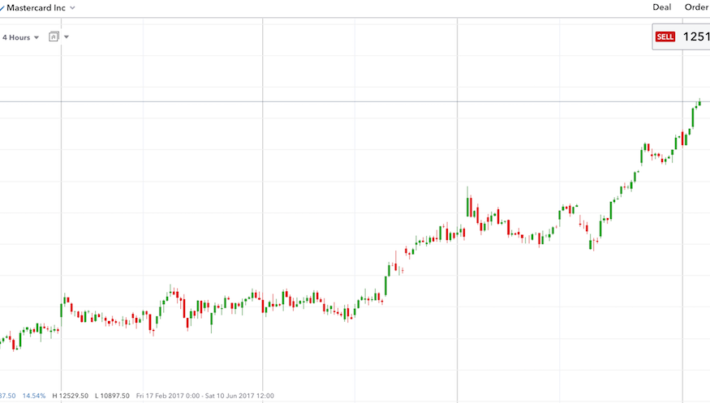 This is a nice steady and well behaved chart. You can clearly see that support and resistance levels have formed and prices have broken out. It is at these price breakouts that I can enter the trades. So as you see, we can make profitable trades using a simple price action trading strategy without the need for using any on screen indicators. You can do this quite easily with a bit of practice. Now if we take an even closer look, we can use candle formations to give us even better entry points and conformation of where the price may be heading. 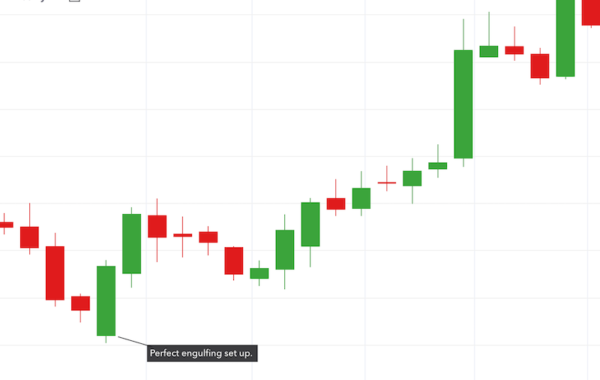 There are many candle formations that can signify a change in direction of the price on a chart. I have actually read a lot about Japanese candle stick patterns. Initially and with what I learnt from reading online, I could see the logic, but there was no real deep information that I could use to gain a better understanding. I deciding on buying a book, or shall I say tome from Amazon… at £60 I did find it a little overrated after I had read the reviews, but maybe I missed something??? Anyhow, it is still a good book and I gained much useful and fascinating information about candle patterns, even if not trading strategies. What I did take from the book was the reasoning behind the formation of certain patterns and why some formations are considered more accurate than others. One can then use this information to gain better entry and exit points. My 3 Favourite Candle Patterns for price action trading. So when using a price action trading strategy here are the 3 most effective patterns [in my opinion] that can accommodate the theory. 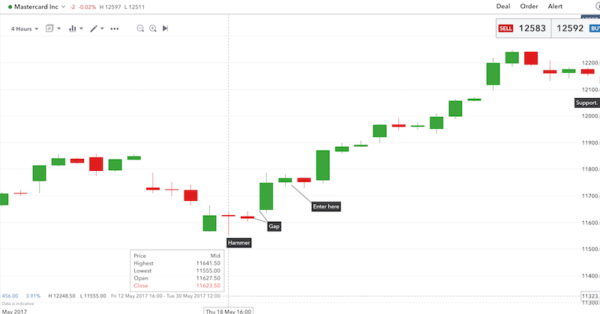 Looking at our chart of Mastercard we can see that we have had a price correction from the 16th May until the 18th May using our 4-hour chart. 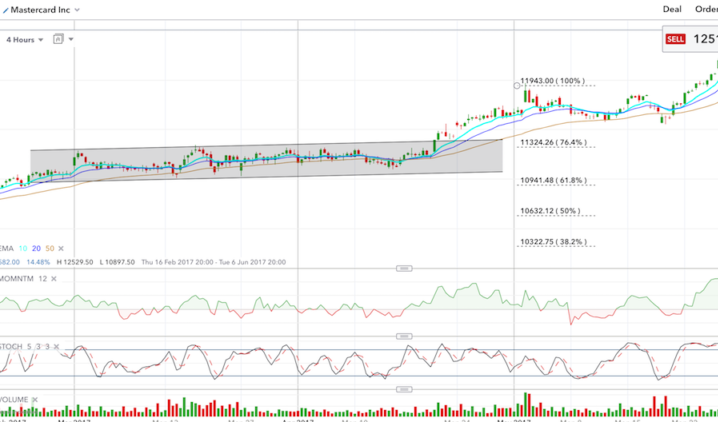 At 16.00 on 18th a hammer candle forms and from there the price continues its upward trend. The reason that the hammer has formed at this level is because the bears have managed to push the price down further but then the bulls have resisted and fought back pushing the price back up. This is why hammers often signal support levels and reversals. In saying that, the bears are still around… and further price action needs to be confirmed before entering the market. NOTE: The longer the time frame of your candles on your chart the more accurate you can consider these candle pattern signals. After the hammer has formed, a small doji candle forms and then we have a big gap and a nice bull candle that can confirm the upward price may continue. You can then enter on the next candle. The engulfing pattern signifies that the bears have lost momentum and that the bulls have taken control. It also signifies downward price movement capitulation and that the price is likely to retreat. A bullish engulfing pattern should be formed with a small down bear candle and a large up bull candle that has very little shadow. 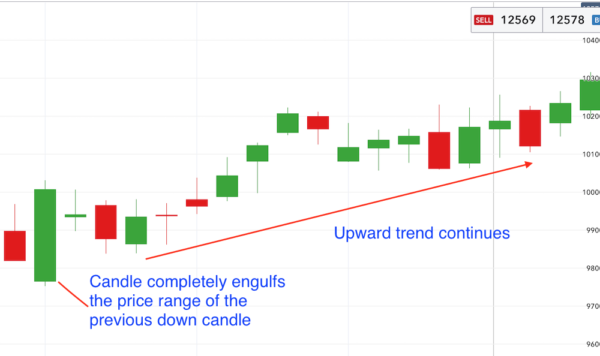 This is one of the most commonly used candle stick patterns to identify price reversal. It is also one of the easiest to identify and understand. 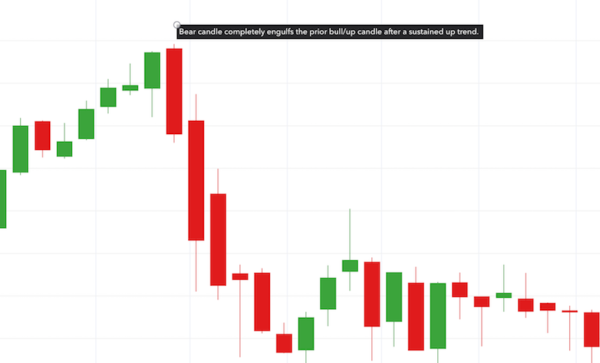 The best place to see a bullish engulfing pattern is at the bottom of a sustained downward trend with a minimum of four consecutive down bear candles that are not increasing in size. A Bearish engulfing pattern is the opposite of a bullish engulfing pattern. A bearish engulfing pattern signifies that a sustained bull period may be about to reverse. The engulfing bear candle must completely consume the previous bull candle. 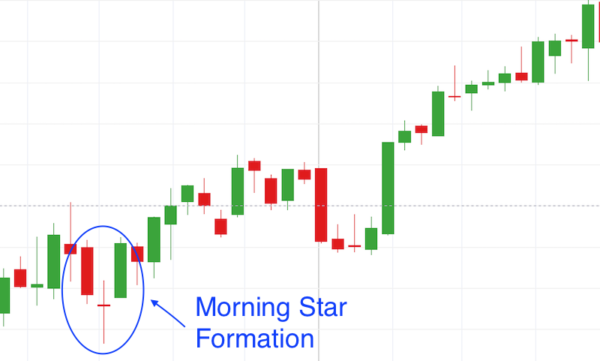 The final pattern that I commonly use or shall I say look for, is the morning star pattern. This is another reversal pattern that consists of a 3 candle set up. The morning star was called such as Japanese rice traders call Mercury [the planet] the morning star and this good omen was considered a sign of brighter things to come. Hence why this pattern is named and formed after a bear market. The down trend has finished and better times are ahead. The 3 candles that form the pattern are one bear candle, one doji [the star] and one bull candle. Reading the formation is as easy as spotting it. The longer the bear and bull candles the more thrust behind the reversal. The bigger the gap from the candles either side of the star, the greater the chance of reversal as this indicates market indecision. The higher up the close of the 3rd candle is [the bull candle] the greater significance this has to the price reversal. The morning star formation is the least common of the candles I mention but many will argue that it is the most accurate in terms of signalling a valid reversal in price. You can read more about candle formations and patterns here. You may find other formations more suited to your style of trading. The book I bought that I mentioned earlier, explains the history of these candles and formations and explains in detail how they were developed when the Japanese initially used them when trading rice hundreds of years ago. I found all of this fascinating and what’s even more bizarre is that traders in the western world didn’t even know about them [candles] until the 80’s. Price action Trading Strategy and moving averages. 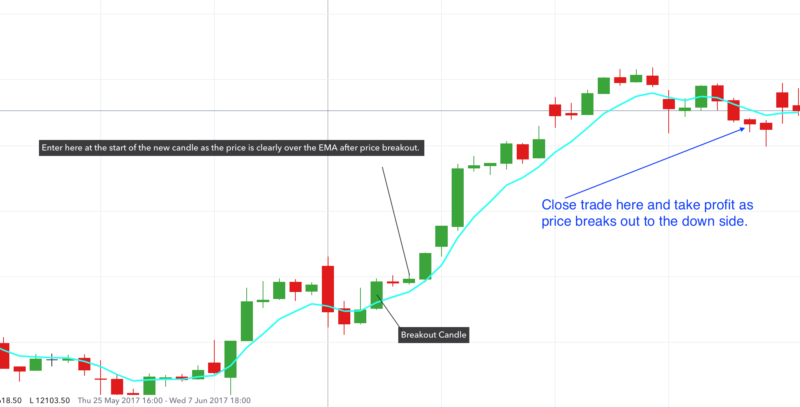 When using a price action trading strategy, adding a single moving average to your chart can really add some weight to making more of an informed decision as to where the price may move to. If you look at our Mastercard chart again you see that I have added a single EMA, Exponential Moving Average. You can conform your earlier findings with the EMA and then enter the market confidently. Before I show you how, let’s take stock quickly…. no pun intended. So to recap… Identify trend, determine support and resistance levels, look for candle formations that may signal a change in market sentiment and then add a 6 period EMA to verify your findings. If all the above sounds like too much effort, then the easiest way possible to trade price action is just by trading above or below your EMA. So in our Mastercard example, we can go long as the candles cross up and over the EMA and go short when they cross over and under. You will get more false signals trading like this, but your win gains will out number your losses. 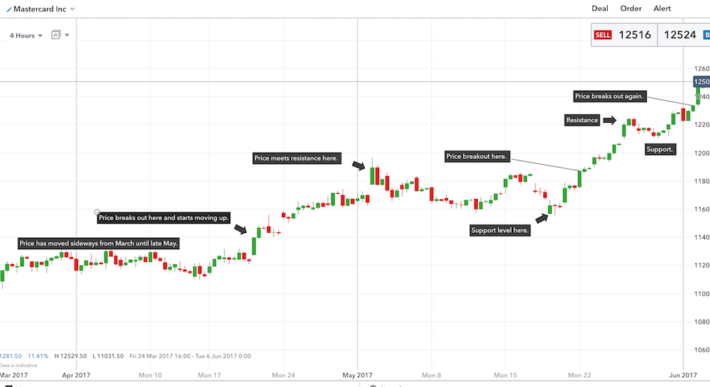 A simple trade the price action strategy can give great returns, without the headache of 20 different indicators on a single chart all opposing each other. It’s a simple as you want to make it in all honesty. Beginner traders can practice this easy enough without spending any money on charting packages or systems.